Five states represent 47 percent of all 2012 medical malpractice payouts. One medical malpractice payout was made every 43 minutes. Female patients made up 57 percent of 2012 medical malpractice payouts. Children’s mental disorders affect boys and girls of all ages, ethnic/racial backgrounds, and regions of the United States. Previous studies estimate up to 1 in 5 children have mental disorder and a new CDC MMWR Supplement finds that millions of American children live with depression, anxiety, ADHD, autism spectrum disorders, Tourette syndrome or a host of other mental health issues. “Mental Health Surveillance Among Children in the United States, 2005-2011,” is the first-ever report to describe federal efforts on monitoring mental disorders, and presents estimates of the number of children aged 3-17 years with specific mental disorders, compiling information from different data sources covering the period of 2005-2011. 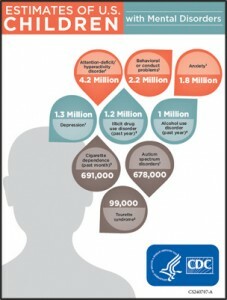 Key metrics from the report are highlighted in this infographic from the Centers for Disease Control and Prevention. The report is an important step to better understand children’s mental disorders, identify gaps in data, and develop public health strategies to protect and promote children’s mental health, so children can reach their full potential in life. You may also be interested in this related resource: Managing Behavioral Healthcare Manual, 4th Edition. Many medical devices have alarm systems. These alarm-equipped devices are essential to providing safe care to patients in many healthcare settings; clinicians depend on these devices for information they need to deliver appropriate care and to guide treatment decisions. However, as shown in this infographic from The Joint Commission, these devices present a multitude of challenges and opportunities for healthcare organizations when their alarms create similar sounds, when their default settings are not changed, and when there is a failure to respond to their alarm signals. You may also be interested in this related resource: Patient Safety Improvement Guidebook. Complex patients remain the top targets of programs to improve medication adherence (MA), but more than half now also zero in on MA levels during transitions in care  up from 37 percent in 2012. Educating patients and caregivers on proper use of medications following a health event helps to curb avoidable hospital readmissions and ER visits. This HINfographic on Medication Adherence illustrates a wealth of data on current programs, including the most likely targets of MA programs, the most common barriers to medication compliance, the most influential tools, and the conditions that respond most favorably to efforts to improve MA. 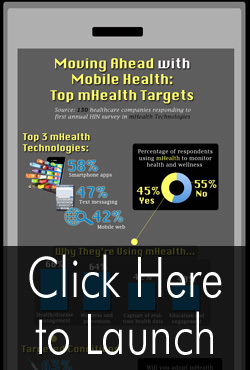 The information in this infographic is derived from responses to the third annual 2013 Medication Adherence survey conducted by the Healthcare Intelligence Network. 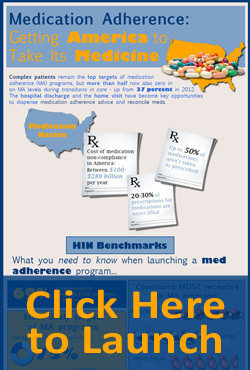 You may also be interested in this related resource: 2013 Healthcare Benchmarks: Improving Medication Adherence. The latest Visualizing Health Policy infographic from JAMA considers who will be covered under the Affordable Care Act’s Medicaid expansion provisions, which states have opted to implement or not implement the ACA Medicaid expansion, the proportion of nonelderly uninsured individuals who will likely remain uninsured, how Medicaid will streamline the enrollment process, and how the cost of the Medicaid will be funded by the federal and state governments. The public health systems in the United States are meant to be at the forefront of prevention, but state and federal investments are shrinking. This infographic published on the Pew Charitable Trusts Web site illustrates how public funding levels vary from state to state. For example, in 2012, Alaska received the most public funding from the Centers for Disease Control and Prevention (CDC) and the Health Resources Services Administration (HRSA), while Indiana received the least. You may also be interested in this related resource: Forces of Change: New Strategies for the Evolving Health Care Marketplace. What do consumers think about the healthcare customer experience? Top-level healthcare executives are focusing on the customer experience to compete for patient loyalty and referrals in today’s unstable healthcare market. But, before they begin, they need to understand how customers perceive healthcare companies and how the customer experience impacts their decision-making. TeleTech® performed an in-depth study of healthcare customers and examined their sentiments about the healthcare experience. Their findings are reflected in this infographic. You may also be interested in this related resource: 2011 Benchmarks in Patient Satisfaction Strategies: Improving the Healthcare Consumer Experience. Despite growing awareness and advances in treatment, the fast-growing developmental disorder of autism has enormous personal, family, and economic impact  and no known cure. For example, one in 50 children have an autism spectrum disorder, affecting 1 to 1.5 million Americans. The disorder is five times more prevalent in males, generating over $60 billion in annual costs  $3.2 million over an individual’s life span. This infographic from Guide to Nursing Degrees looks at some metrics and benchmarks related to autism, including the signs of autism, the science of autism and recent developments and treatments. You may also be interested in this related resource: Neurology and Neurosurgery Clinical Review Criteria Guidelines for Managing Care, 3rd Edition. Completing a quality-of-life questionnaire at a healthcare provider’s office could help patients live longer and better, according to a statement from the American Heart Association (AHA). Patient surveys can help reveal depression, which can significantly worsen cardiovascular health, but is often underdiagnosed despite being common among cardiovascular (CV) patients, researchers say. Healthcare providers can assess their patients’ CV health by using standardized patient surveys, which focus on a patient’s quality of life. These surveys can directly measure the impact of heart disease on patients, including their symptoms, quality of life, and ability to function physically and mentally. For those patients diagnosed with heart disease, the surveys can directly measure its impact, including their symptoms, quality of life, and ability to function physically and mentally. They can also predict other events, including future cardiac episodes, and should become a part of routine care. In another example of integrated care, new Behavioral Health Home Certification from the Joint Commission will make many patients’ lives better. Designed as part of a nationwide effort to expand and improve healthcare services, behavioral health homes integrate physical and behavioral healthcare services to provide treatment to address the needs of the whole person. The certification program will provide a framework for this, emphasizing care coordination and quality. Health home providers do not need to provide all the services themselves, but must ensure that the full array of primary and behavioral healthcare services is available and coordinated. Postponing mammography screenings could help women live longer and better, according to Johns Hopkins researchers. Data shows that routine screening in women younger than 40 increases rates of cancer detection in young women, but only reduces mortality risk by a very small percentage. Instead, the tests are more likely to result in over-diagnosis and unnecessary treatment, including biopsies, lumpectomies and mastectomies, and weeks of radiation and potentially toxic drugs. And false positives could result in avoidable procedures and psychological trauma. Despite these findings, and recommendations from the U.S. Preventive Services Task Force (USPSTF) to postpone mammography screenings until age 50, younger women continue to undergo the routine breast cancer test. The fact that insurance companies continue to pay for these mammograms for women in their 40s is most likely the reason for the persistently high rate of screening, researchers state. Examining Medicare prescription plan benefits more closely could help beneficiaries to manage their money and health better, according to a new Walgreens survey. Prescription drug costs are among the top concerns for more than one-third of Medicare Part D beneficiaries, with one in five admitting they’ve had to delay filling a prescription or skip doses to help manage medication costs. Survey respondents revealed that only half realized that co-pays for Part D prescriptions can vary by pharmacy; and less than one fourth were aware of whether their plan offered a preferred pharmacy option. 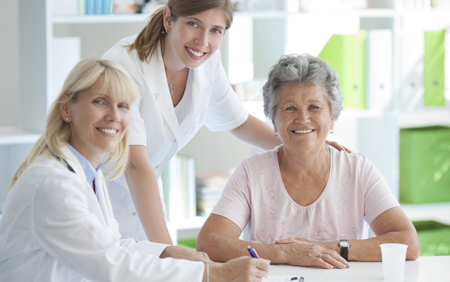 Beneficiaries can save hundreds of dollars each year on co-pay costs by using a preferred network, researchers state. Care to tell us how case managers are helping to make your organization run better? There are only a few more days before we close out our Healthcare Case Management survey, so why not take a moment and fill it out; we will send you a free executive summary of the compiled results.